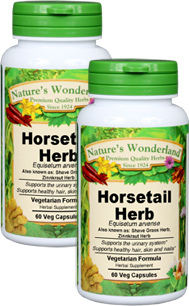 Horsetail Capsules - 400 mg, 60 Veg Capsules each (Equisetum arvense) - Penn Herb Co. Ltd.
Horsetail has also been used for centuries as an herbal diuretic to support urinary health. In fact, the Cherokee, Chippewa and the Potawatomi people, all utilized Horsetail preparations for kidney and bladder support. Get results you can see and feel with Nature’s Wonderland’s premium quality Horsetail. COMMON NAMES: Bottle Brush, Colla de Caballo, Kangaskorte (Finnish), Pewterwort, Scouring Rush, Shave Grass, Zinnkraut. Hair, skin & nails support; split ends; bone & joint health; supports healthy urinary tract; promotes kidney & bladder health; supports healthy blood circulation. As an addition to the diet, take 1 or 2 capsules three times daily with water at mealtime. HORSETAIL SHOULD NOT BE USED BY PERSONS WITH CARDIAC OR RENAL DYSFUNCTION. NOT RECOMMENDED FOR LONG TERM USE OR USE BY CHILDREN.